It is fall and time for soups and stews! My favorite time of year. There is nothing more comforting than sitting on the back deck with jeans and a sweater with a bowl of delicious hot, hearty soup and a glass of wine. Perfection! 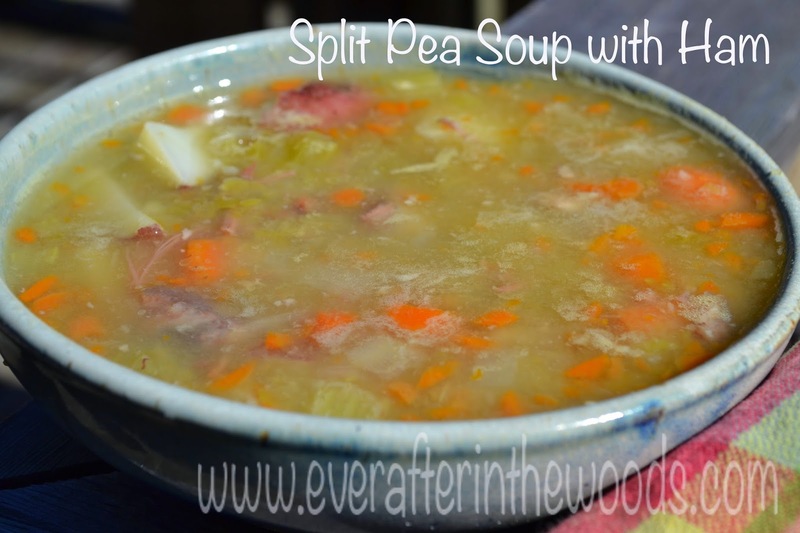 Here is one of my favorite recipes for Split Pea Soup with Ham. This would be perfect if you have a ham bone left over from Sunday dinner. 1- Cover ham bone with water in large pot on stove pot, simmer on stove for approx. 3 hours until all meat has fallen off the bone and the air smells fragrant. 2- Strain broth into new pot. ***pick through saved straining*** for all meat and shred into bite size pieces and add to broth. 3- Add all remaining ingredients to broth and bring to a boil. reduce heat and simmer for at least one hour or until potatoes are soft. 4- Remove 1/2 of the soup and place into a blender or food processer and blend until a smooth consistency and add back to pot. This will make your soup a thicker consistency. I love split pea soup! I even have all the ingredients on hand. Thanks for solving the what-to-make-for-dinner dilemma! I love that fall is here so we can make soups again. And this split pea soup looks amazing!! Thank you so much for sharing at Creative K Kids Tasty Tuesdays. I’m going to pin this to the Tasty Tuesdays Board. We would love for you to link up again with us this week!